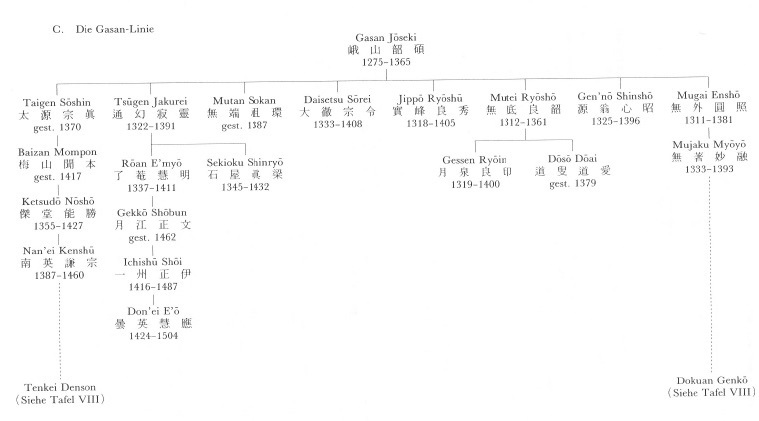 Although there is good reason to speak of the "Zen school" as a distinct branch of the Buddhist tradition of Japan, there has never been any organized social or institutional entity bearing that name. 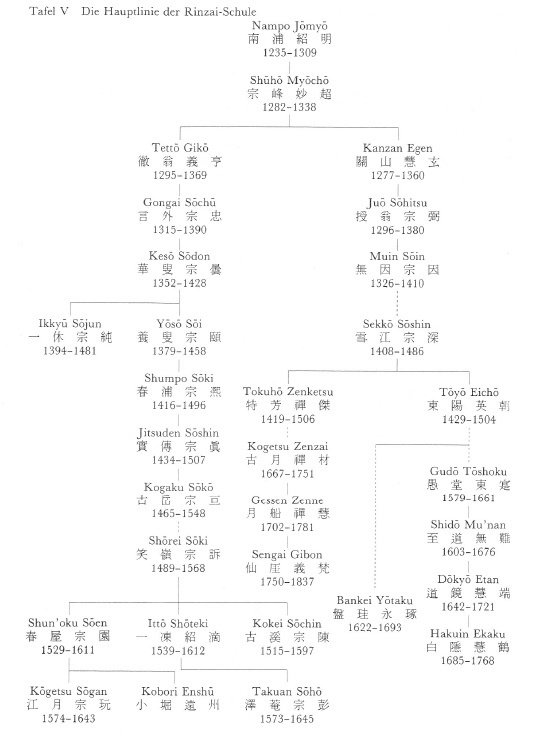 At present, there are twenty-two comprehensive religious corporations (hōkatsu shūkyō hōjin 包括宗教法人) registered with the Japanese government that are recognized as belonging to the Zen tradition (Zenkei 禪系). 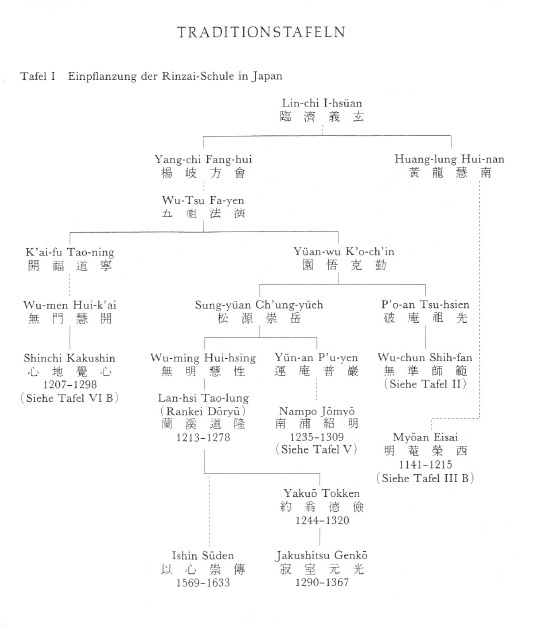 These include: the Soto School (Sōtōshū 曹洞宗); fifteen separate corporations that identify themselves as branches (ha 派) of the Rinzai lineage (Rinzaishū 臨濟宗); the Ōbaku School (Ōbakushū 黃檗宗); and five small corporations that have splintered off from the Soto and Rinzai organizations. 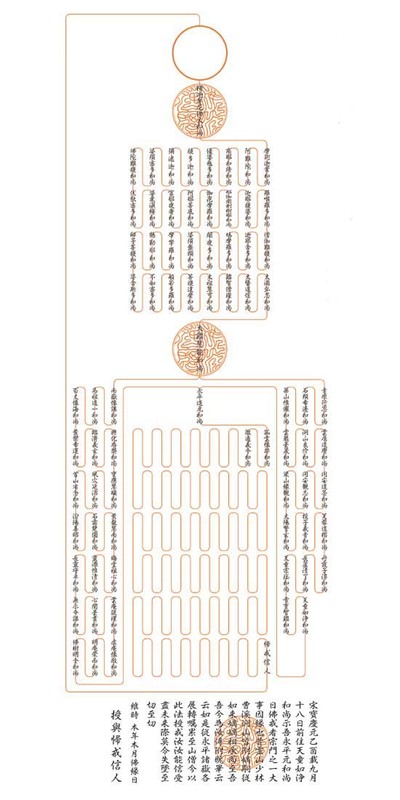 Each of the twenty-two Zen denominations has a number of temples affiliated with it, ranging from 14,664 in the Soto School to 3,389 in the Myōshinji branch of the Rinzai lineage (Rinzaishū Myōshinjiha 臨濟宗妙心寺派), 455 in the Ōbaku School, a few hundred in the smaller Rinzai denominations, and just a handful in the smallest of the corporations (all data from Bunkachō 文化廳, ed., Shūkyō nenkan 宗教年鑑, 2003 Edition). (2) Dōgen Kigen 道元希玄 (1200-1253), founder of the Dōgen branch (Dōgenha 道元派) of Soto Zen. 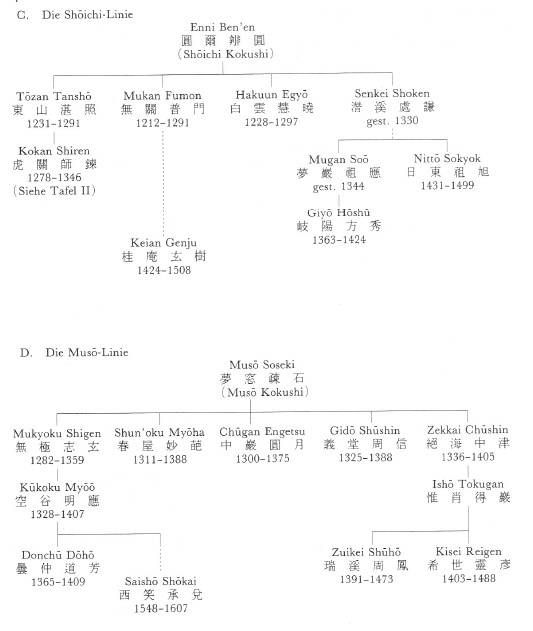 All the other branches of the Zen lineage that flourished in the past are said to have died out, having failed at some point to produce any more dharma heirs. Most of the Zen denominations in Japan operate training monasteries in which the bureaucratic structures, ritual calendars, and modes of practice are modeled after those found in the leading Buddhist monasteries of Song (960-1279) and Yuan (1280-1368) dynasty China. Those institutional forms were first imported into Japan in the Kamakura period, chiefly (but not exclusively) by the same monks who transmitted the Zen lineage. 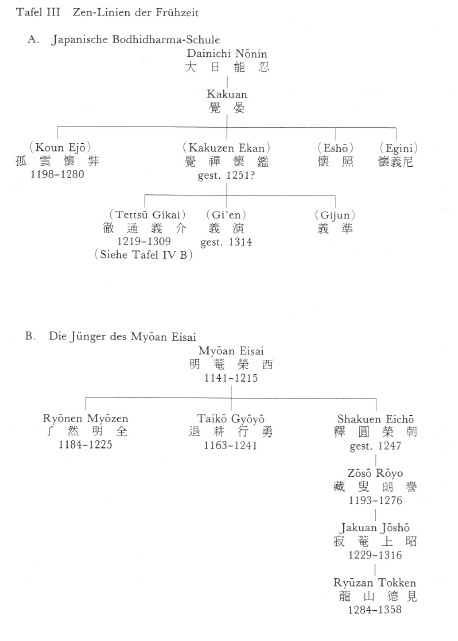 Texts containing the religious lore of the Zen lineage in China - genealogies of dharma transmission, biographies of Zen masters, records of their discourses, and koan collections - were also brought to Japan at that time, and have been handed down to the present within the various denominations as the common heritage of the Zen school. reflecting Dōgen's early teacher Myōzen, as well as Rujing. all other Japanese lines having since become extinct. On the eighteenth day of the ninth month of the first year of the Pao-ching era of the Sung dynasty [宋寶慶 Song Baoqing (1225)], the late abbot of the Tien-tung [天童如净 Tiantong Rujing, 1163–1228] instructed me, Eihei Dōgen oshō [永平道元和尚], saying: "The Buddha Sila are the single most important matter of our school. 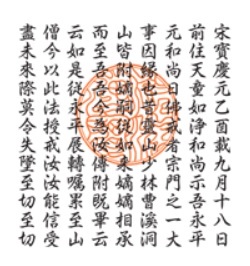 In the past, the masters of Mount Grdhrakūta [霊鷲山], Shao-lin [少林 Shaolin], Tsao-chi [曹溪 Caoxi], and Mount Tung [洞山 Dongshan] transmitted these Dharma Sila of the Tathagata to their successors generation after generation until they came to me." Now I transmit them to you. You should receive them in deep faith and not permit them to be discontinued. For this I earnestly pray. Heinrich Dumoulin: Geschichte des Zen-Buddhismus. Band II: Japan. This lineage chart displays the lineages of active members of the SZBA as of Sept 18, 2008. Members in each lineage are displayed in a box (or boxes) in alphabetical order. 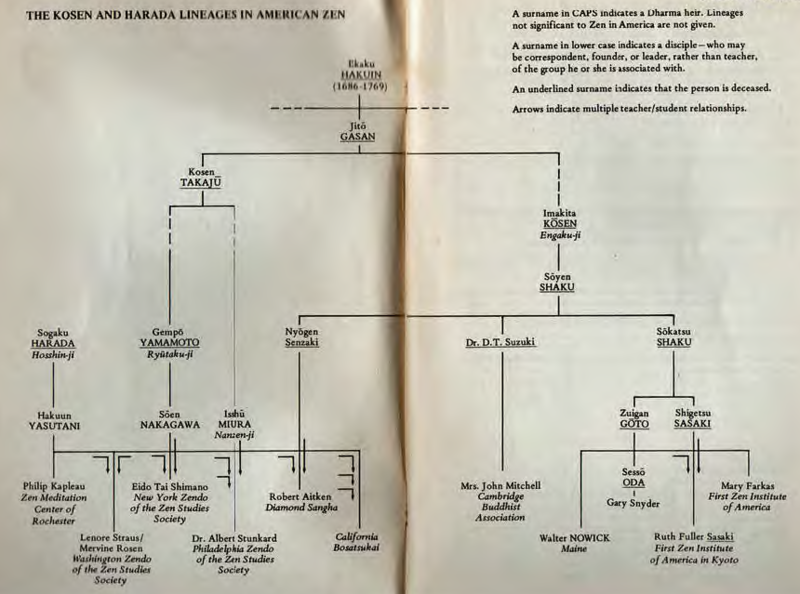 The horizontal arrangement of the lineages on each page is of no particular significance. 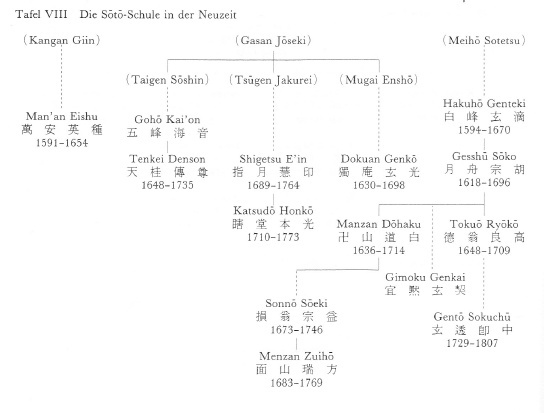 In addition to major Soto Zen figures included in members' lineages (such as Banjin Dotan (pg 2 col 8), Bokuzan Nishiari (pg 2 col 9), Gento Sokuchu (pg 2 col 2), Manzan Dohaku (pg 2 col 8), Tenkei Densen (pg 1 col 2), and others), the lineages of a few others are included to show where they connect (including Daigu Ryokan (pg 2 col 5), Menzan Zuiho (pg 1 col 5), and Unkei Tosui (pg 2 col 11)). 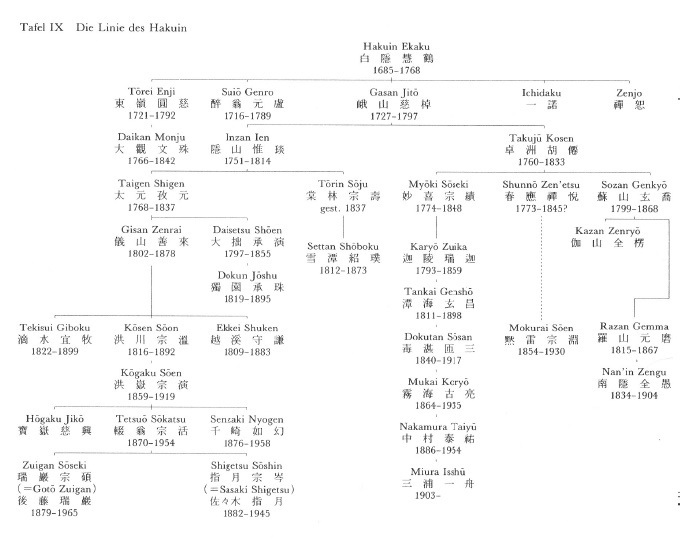 Also included are the lineages of some 20th century figures including: Soyu Matsuoka (pg 3 col 1), Eko Hashimoto (pg 3 col 5, teacher of Dainin Katagiri (pg 2 col 2) & Tsugen Narasaki (pg 3 col 4)), and Ian Kishizawa (pg 2, col 9, teacher of Renpo Niwa (pg 1 col 4) & Shunryu Suzuki (pg 1 col 1)). 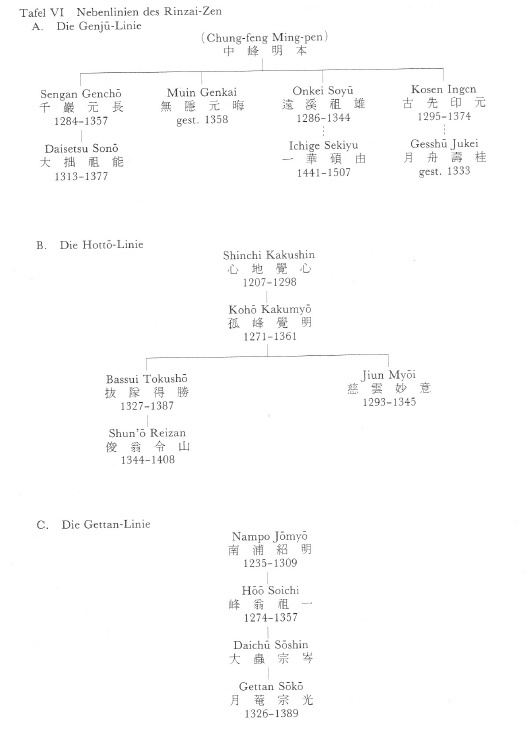 Eko Hashimoto, Ian Kishizawa, Kodo Sawaki (pg 2 col 1) and Daiun Sogaku Harada (pg 2 col 4) all studied with Oka Sotan (transmission from Tōken Mitetsu, studied with Bokuzan Nishiari). 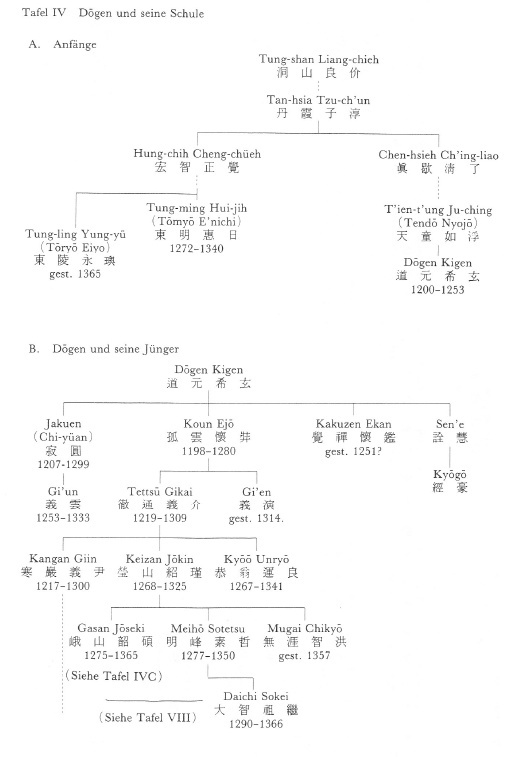 Taizan Maezumi (pg 1 col 2) studied with Haku'un Yasutani (teacher of Koun Yamada (teacher of Chotan Aitken)) who in turn studied with Daiun Sogaku (pg 2 col 4). Tenzan Keibun (pg 2 col 9) worked extensively with his brother Kobun Chino (pg 2 col 7). 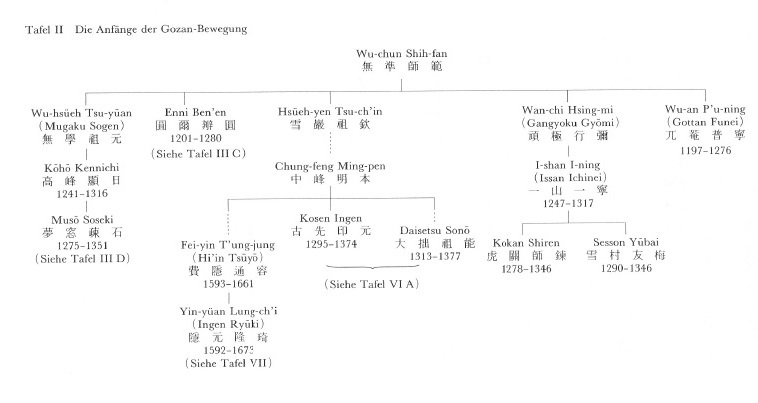 The Ch'an Tsung in Medieval China: School, Lineage or What? Pacific World Journal, New Series Number 8, Fall 1992, pp. 18-31. Honolulu : University of Hawai'i Press, 1995, XV, 381 p.
Honolulu : University of Hawaii Press, 2001, 384 p.
in Takeuchi Yoshinori et al., ed., Buddhist Spirituality. 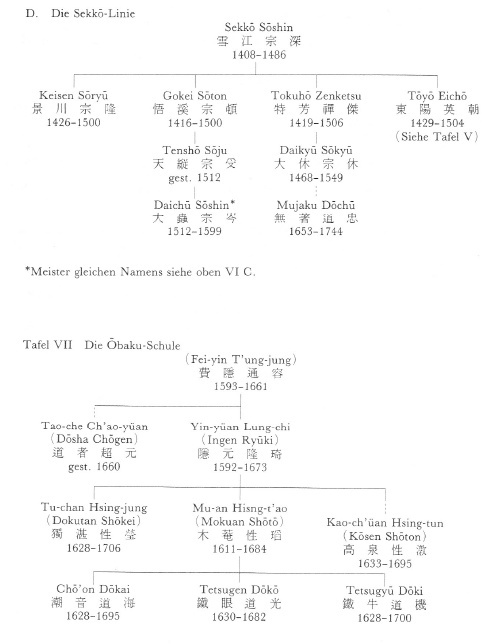 Volume 2: Later China, Korea, Japan, and the Modern World, (New York: Crossroad, 1999), 367– 88.
head temple of the Kyoto five.